Joel Feder December 13, 2017 Comment Now! 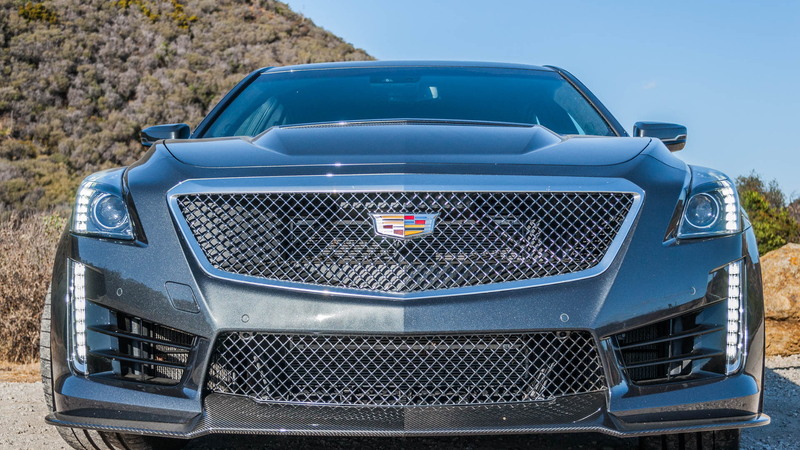 With far more horsepower than anyone truly needs, loud noises that will instantly put hair on your chest like a Chia Pet, and a chassis that should be a dynamic benchmark for the Germans, Cadillac has proven the third time is the charm for CTS-V.
After spending nearly a week with a 2018 Cadillac CTS-V in Los Angeles, we came up with 8 things you simply must know about the American super sedan. 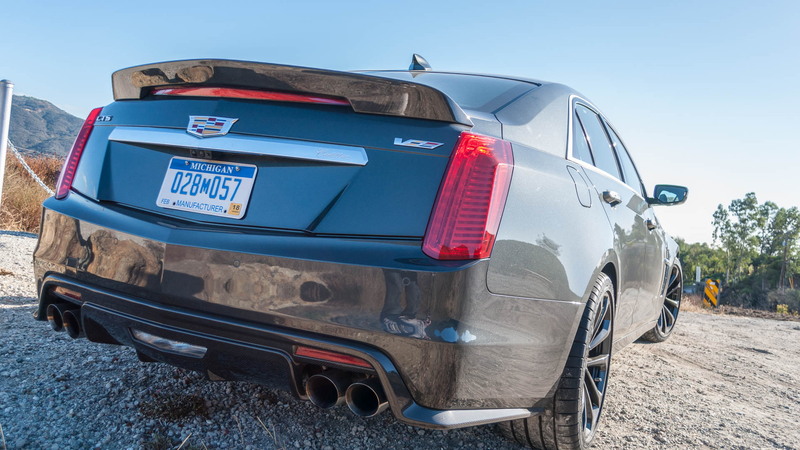 The third-generation Cadillac CTS-V sets a high bar for its dynamics. With a curb weight of 4,141 pounds, it's 374 pounds lighter than the 2018 Mercedes-AMG E63 S, a model that's an entire development cycle newer than the Caddy. Take a corner at speed in the CTS-V and its reflexes are immediate. The steering isn't terribly heavy, though you can artificially dial in more heft if you're into that sort of thing. It's progressive and provides enough road feedback. This isn't Porsche 911 GT3-grade steering, but it's very good. The chassis is brilliant, light, and dynamically surprising with how fleet of foot it feels as you push it. The heft of the engine up front is present, but not intrusive. Kudos to the Cadillac engineering team for their awe-inspiring ability to make a class featherweight feel even lighter than it is. Mark Reuss, executive vice president of product development at GM dubbed the C7 Chevrolet Corvette Z06 "The Big Nasty," and the third-generation CTS-V uses the same 6.2-liter supercharged LT4 V-8 delivering 640 horsepower—10 horsepower shy of the same engine in the Z06—in a four-door sedan. The only production sedan with a more ridiculous engine is the Dodge Charger Hellcat. If you want to fly under the radar, the 2018 Cadillac CTS-V probably isn't the car for you. The massive air inlets on either side of the grille up front to feed the intercoolers aren't subtle. Neither is the bulging hood with vents for heat extraction. 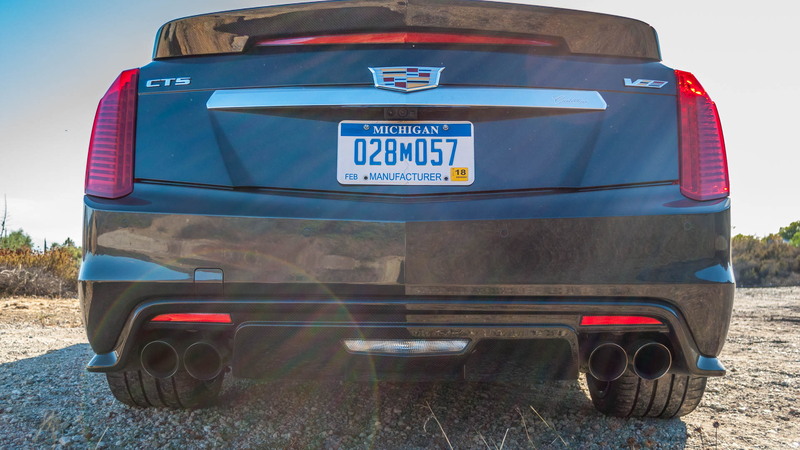 The flared front fenders with functional air extractors, quad-exhaust tips out back, and massive rear decklid spoiler all give the CTS-V a menacing demeanor. And that's before you take into account the available $6,250 carbon fiber package my test car had which replaces the front and rear diffusers, hood vent, and rear spoiler with exposed weave carbon fiber. 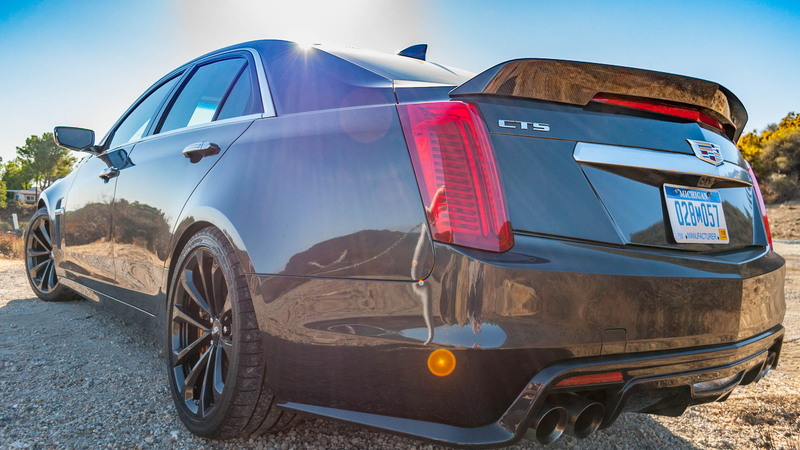 If the exterior design doesn't somehow get you noticed the noise the CTS-V creates will. To put it simply, it's loud. It has an active exhaust setup, but why bother? Just default it to Track Mode and let that exhaust sing all day, everyday. A cold start just sounds mean, and if you happen be to in a cement parking garage, forget about it. Your grandmother might need a change of undergarments. I filled the hills of Malibu with the sweet, sweet sounds of a large displacement V-8 and supercharger whine. The canyons may still be echoing. There's no such thing as a free lunch. All that noise and power comes at great expense in the form of fuel. The CTS-V guzzles it no matter the situation. Blasting through the hills of Malibu, I saw an indicated average of 5.4 mpg on the trip computer [job well done—Ed.] and when mostly lugging it around town in Los Angeles, a mere 13.4 mpg. It likes the good stuff, so plan on regular premium fuel stops. Despite having the Z06's engine, the Cadillac's 8-speed automatic transmission isn't the same regardless of sharing the same number of forward gears. The Z06's transmission is a transaxle setup, where as the CTS-V's 8-speed bolts right to the back of the engine. While changing the car's modes between Touring, Sport, and Track do change the shift patterns and algorithm, it's really not even noticeable. The Performance Algorithm Shifting and Performance Algorithm Logic, long ways of saying adaptive logic algorithms, will automatically adapt the transmission's programming to do its best to match your current driving style. It did an admirable job in the back hills of Malibu. After a few turns of hard driving it realized what was going on and would hold gears longer, downshift quicker, and keep the engine revs up. Once back onto the sedate Pacific Coast Highway, it took only a minute or two to realize the change and adapt again. It's a nit-pick, but it would be ideal if the three modes would kick the transmission into far more aggressive programming to reduce the adaptation delay. The steering wheel-mounted paddle shifters are placed right, but they respond a little too slowly to inputs. The CTS-V's brakes more than make up for any transmission miscues. The Brembo system is strong, with enough force to throw you forward into your seat and they're so aggressive that they'll trigger the car's seatbelt-cinching mechanism in certain, exceptionally hard braking situations. Ask me how I know. The bite is strong with progressive pedal movement and no noticeable fade while being pushed on the back roads of Malibu. The front 15.3-inch rotors are grabbed by staggered 6-piston calipers and the rear's 14.3-inch rotors are controlled by 4-piston calipers. The result: stopping power that instills—and delivers—confidence. 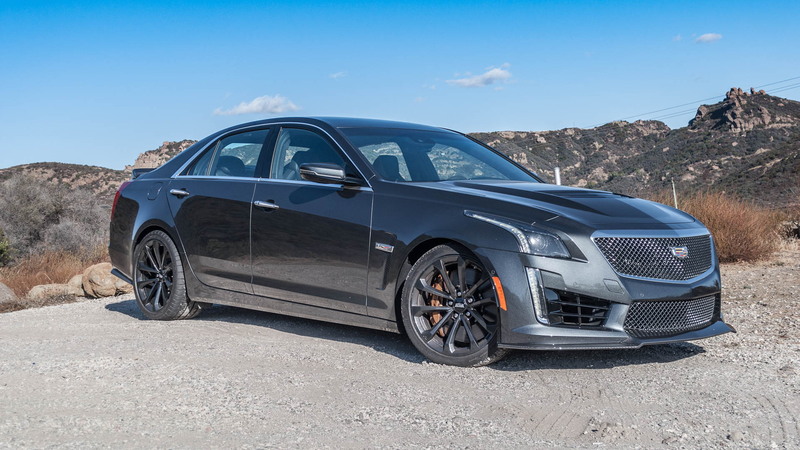 Starting at $86,295 the 2018 Cadillac CTS-V isn't cheap, but it does represent a good value. Tack on the carbon fiber package for $6,250, luxury package for $2,500, Recaro front seats for $2,300, performance data recorder for $1,600, gas guzzler tax of $1,000, dark gold Brembo brake calipers for $595, and suede-covered steering wheel for $300 that my test car was equipped with, add in the $995 destination charge, carry the 9, and suddenly you are at $102,735. That's a lot of money, until you realize a base 2018 BMW M5 with less power starts from $103,595, and the 2018 Mercedes-AMG E63 S stickers from $104,400 without options. The CTS-V suddenly could be called a value, which is enough justification for us.